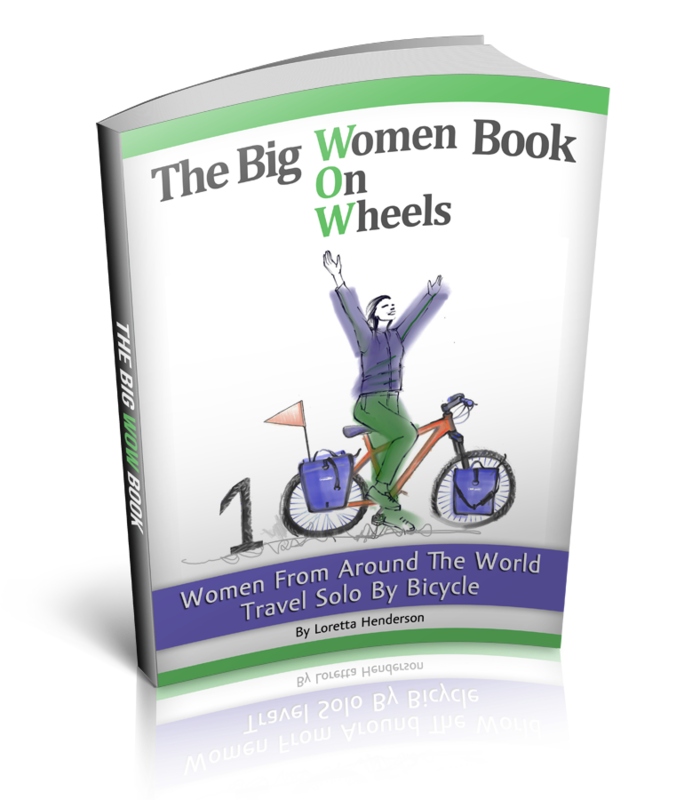 Solo Female Cycling Around the World: Tires and Tears…Have You Ever Cried On A Bicycle Tour? Tires and Tears…Have You Ever Cried On A Bicycle Tour? With big ole tears running down my cheeks I take three deep breaths and carry Pandemic The Magic Bicycle over my head through the river current. The road has been deteriorating throughout the day with the river getting deeper at each road wash out. It is not quite as deep as I had imagined and only comes above my knees. However, it’s powerful velocity feels like three bull dozers trying to clear me away. 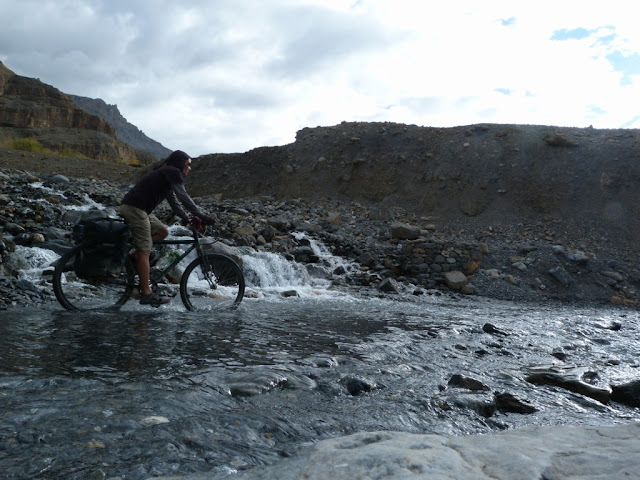 I push back through the forceful flowing water, get my panniers and drag my legs through the cold Himalaya mountain water hoping for the best for a second time. I am still crying, however my feet, shoes and legs are now very cold and shock my eyes into drying out. I freedom camp solo, travel alone and have pedaled a crossed deserts, mountains passes and traveled throughout arctic climates alone without concern. However, this river crossing at 3800 meters (12500 feet) has gotten the best of me. I have long ago discovered that physical and mentally I will take it farther than most, however, emotionally I melt down long before I will give up. And yes, occasionally I can be seen, pedaling along with tears rolling down my cheeks hiding behind my sunglasses. It is a good thing that there is no shame in tears because river current is my weakness. I have been washed down rivers a few times in my life. Once in the forty mile river in a class 3 rapid in the arctic, I flipped an old school wooden canoe and was rescued downstream by kayakers with a rope. Another time, I filled my lungs up with water and was punched by a good friend in the chest to clear my airway. I can swim, in fact I am a lifeguard but humbled time and time again by the power of water. Cascading current has a way of making me feel small, very small and very much alone. At 108 pounds (49 kilos) and 5 foot 1 (1.55 meters) I have been swept off my feet without warning while trekking through rivers right next to larger friends. However, I have always considered myself huge compared to an Asian person. Normally, I would never fess up about such humbling emotional moments, however, after having talked to a few folks on bicycle tour about tires and tears, it turns out that I am not all that alone after all. Here’s what I found out about crying on tour. Lonesome Blues. A couple of male bicycle tourist said they cried while pedaling because bicycle touring solo is lonesome. For more about that read Boo Hoo Hoo Tackling The Lonesome Blues. Turtles. A friend cycled up on another solo bicycle tourist in Kyrgyzstan on the side of the road and found him crying hysterically over a turtle. The turtle had been run over; his shell was cracked and he was squealing in pain. The bicycle tourist was also squealing in pain, crying, trying to sort out how to help the turtle. Always Saying Good-bye. One touring couple that I met in India told me that both partners had cried that week. He started crying when it was time to say good-bye to yet another new friend, a sweet family, who had brought them in for the night. Exhaustion and Hunger The other half of the touring couple had a little cry a few days earlier on the side of the road about ½ km from the town that was the stop for the day. She was hungry, tired, frustrated and did not want to go on. She laughed when she told me because she hadn’t realized the destination was right on the other side of the hill less than ½ km away. Celebration. A couple of cyclists I asked reported that sometimes making it to the goal is worth a few tears. For one, it was pedaling across Canada to the ocean, for the other it was completing a dream, a 6 month cycling loop in South East Asia. Tires and Tears? How about you? Are you willing to share an Oprah worthy bicycle touring moment? I’ll send some cyberspace tissue for the best story in the comment boxes below, and please remember, there is no shame in tears even on a bicycle tour. I'm planning a year-long solo bike trip and know that there will definitely be tears at many points. You are my heroine for your bravery and I hope to meet you one day. I think what you're doing is incredible. WE cried on the final day of our 4 year tour around the world. We've been out since, to Southeast Asia and the Heartland of the USA including a week of RAGBRAI. But, we still miss the open, unending road. I sometimes cry when I feel a deep happyness coming into my chest. I never felt that before touring as I do now. So it s tears of joy, and believe me, it s deeply good but rare ! I have cried TEARS OF JOY many times!